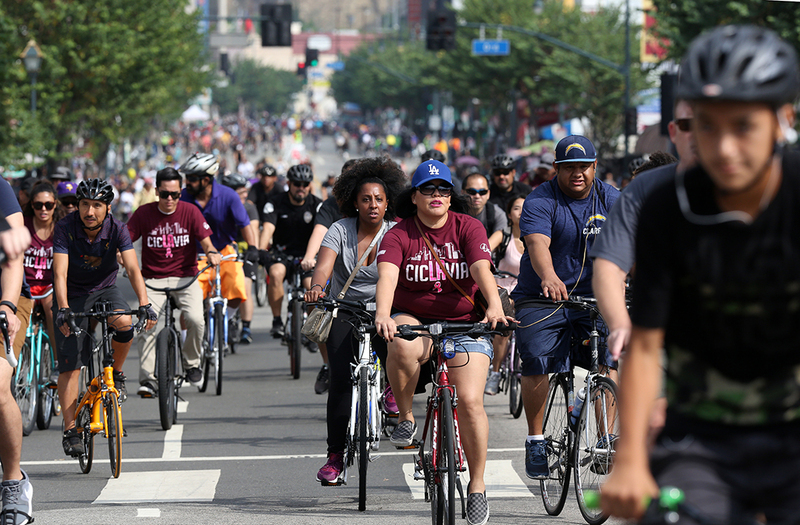 Bicyclists ride along the streets of downtown Los Angeles on October 18, 2015. As economic disparities and climate change risks rise, mayors must develop solutions that build resilient communities, create new economic opportunities, and support racial justice. These mayors understand that no city is an island unto itself, especially in a changing climate.4 Creating a just and sustainable economy in one place can improve lives in nearby communities. If the changes and improvements implemented are significant and, eventually, replicated elsewhere, the benefits could extend across the nation and even abroad. Ultimately, all of humanity is draining the same pool of natural resources and relies on the same climate system. Thus, reducing the use of those resources and the pollution from that use could pay far-reaching dividends. It will take years for many people in Texas, Louisiana, Florida, Georgia, Puerto Rico, the U.S. Virginia Islands, and South Carolina to recover from these storms—tragically, some never will. As devastated communities work to pick up the pieces, it is crucial that local officials rethink the design of their communities and infrastructure and rebuild in ways that reduce future flood, extreme weather, and pollution risks—particularly in areas where families struggle to make ends meet and in communities of color, both of which are exposed to these threats at disproportionately high rates. While climate change affects us all, it hits families living paycheck to paycheck the hardest. In a world of growing inequities, it is not mere coincidence that the poorest among us not only live and work in areas most prone to flooding, heat waves, and other climate change effects but are also least resourced to prepare adequately for and withstand those impacts.10 Fortunately, city officials and community leaders across the country are taking steps to improve climate change resilience, along with addressing associated economic, racial, and social equity issues. Progress is most notable in the following cities, each of which is featured in this report: Ann Arbor, Michigan; Atlanta, Georgia; Baltimore, Maryland; Berkeley, California; Boston, Massachusetts; Charlotte, North Carolina; Chicago, Illinois; Cleveland, Ohio; Grand Rapids, Michigan; Los Angeles, California; Miami, Florida; Nashville, Tennessee; New Bedford, Massachusetts; New York City, New York; Newark, New Jersey; Oakland, California; Portland, Oregon; San Jose, California; Seattle, Washington; Spartanburg, South Carolina; Minneapolis, Minnesota; Toledo, Ohio; and Washington, D.C. Along with those examples, this report offers recommendations for mayors on designing and implementing strategies to build just and resilient cities and to create new economic opportunities for many of the people left behind by recent economic booms. The report findings reveal that climate change policies and preparedness strategies are most effective, and draw the most support from residents and community groups, if they are designed through inclusive processes and address the intersecting problems of racial, income, and environmental inequalities.11 In addition, climate solutions are the most successful when city leaders partner with community groups to set priorities and shape those solutions. By embracing strategies that support pathways to a just economy while reducing extreme weather, flooding, and other climate change risks, city officials can expand access to living wages and safe jobs, quality schools and affordable housing, and safe and sustainable neighborhoods. Make equity, racial justice, and a just economy core goals of city resilience and climate action plans. Develop climate action and resilience plans that tackle historic inequities and racial injustice, both of which exacerbate climate change and other environmental risks in communities of color and low-income neighborhoods. Build trusting relationships with communities and create an inclusive environment that supports partnerships with community groups and collaboration across city departments. Emphasize diversity in city hiring and remove biases in city planning that perpetuate inequities. Collaborate with community groups and build neighborhood capacity to shape and implement climate change solutions. Build community support for climate and resilience plans by raising awareness of climate change risks; partner with community groups to design effective climate strategies and public engagement processes that respect cultural protocols; and foster local leadership. Expand economic opportunities and the availability of affordable housing. Create local hiring and job training programs that provide pathways to living-wage jobs in clean energy and other fields. Support healthy, inclusive development and implement anti-displacement strategies that improve city livability without serially pushing out longtime residents with low socio-economic mobility. Support community land trusts and cooperatives to increase access to community-owned affordable housing and solar power. Increase access to affordable and clean energy. Develop innovative financing options to provide energy services to low- and moderate-income families. 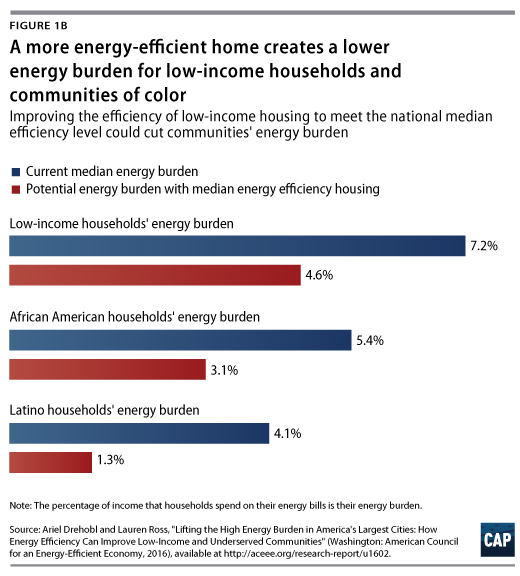 Deploy energy conservation strategies that lower pollution and energy bills, improve public health, and foster racial and economic equity. Adopt inclusive and equitable policies and incentives to achieve 100 percent zero carbon energy by 2035 or sooner and to create local jobs. Ensure access to affordable and clean transportation. Expand public transit; increase the use of low- and zero-emission rapid transit and electric buses; adopt regional transit solutions; provide affordable bike-share access, and make neighborhoods more pedestrian-friendly to increase access to economic opportunities and curb pollution. Invest in resilient infrastructure and nature-based solutions. Invest in maintaining and building infrastructure that can withstand more extreme weather and flood risks, curb carbon pollution, and provide economic and other benefits to residents. Prioritize infrastructure investments in communities facing the greatest needs. Update building and infrastructure codes and standards and expand natural areas and green infrastructure to reduce flood and extreme weather risks and create healthy and sustainable communities. Support emergency preparedness and resilient disaster recovery. Work closely with community groups to prepare for more extreme weather emergencies and disasters in a changing climate, including heat waves. Improve land-use planning to reduce sprawling development in flood-prone areas. Invest in communication and planning strategies to share critical information during emergencies and disasters, making vulnerable communities a priority. Support social cohesion and deeply connected communities. Support community ownership of resilience assets to strengthen local economies. Integrate equitable economic development strategies into resilience planning and respect and support racial and cultural diversity and informal community networks. Provide high-quality public spaces and access to quality education, health care, food, and the arts. Use innovative financing to strengthen community resilience and livability. Use municipal bonds, public-private partnerships, and other strategies to finance energy efficiency, extreme weather, and climate change preparedness. Leverage federal, state, and county funds to buy out high-risk properties and help residents voluntarily move out of flood-prone areas. Partner with nonprofit groups and the private sector to increase residents’ access to insurance and loans to lower their risks in the face of extreme weather and flooding. Through these actions, mayors across the country can strengthen the climate change resilience, public health, and prosperity of all their city residents. In a nation deeply divided by economic disparities, the problem of social and economic inequality continues to be a significant concern in cities and communities around the country. Lack of access to good jobs and other economic opportunities; disproportionately high air and water pollution and public health risks; limited availability of affordable, safe, and energy-efficient housing; and the absence of affordable and clean energy sources are all issues that stem from historic inequities and racial injustices that still plague U.S. cities.21 These challenges—the legacy of systemic racism, social injustice, and discriminatory policies—are compounded by the present-day problem of climate change. Together, these issues put families struggling to make ends meet, and who are already overburdened by polluted air and water, on the front lines of the harmful impacts of a hotter world. Climate change and social justice experts have concluded that “climate resilience requires more than technical fixes.”22 To build resilient cities, mayors must also support policies that redirect an off-kilter economy that has historically benefited the few by enabling the accumulation and concentration of resources and power. To accomplish this, mayors must tear down barriers to economic opportunities for working families and those who have borne the disproportionate costs of environmental and racial inequality. Still, the financial burden of reducing climate change risks can be crushing for cash-strapped cities already struggling to modernize crumbling infrastructure and improve the quality of city services. Under the strain of tight budgets, urban sustainability and resilience programs are often underfunded.30 City leaders increasingly need to explore nontraditional approaches to project financing to support resilience initiatives. For example, cities can leverage municipal bonds and public-private partnerships to reduce rising extreme weather, flooding, wildfire, and other climate change risks. 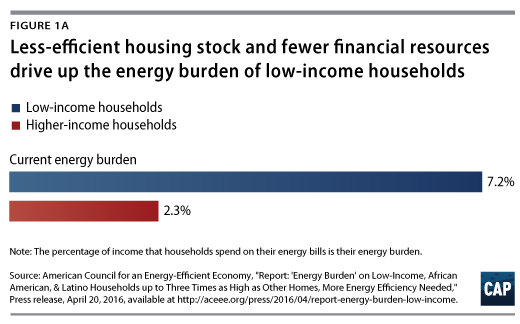 Similarly, energy-savings-performance contracting allows cities to pay for energy efficiency improvements with their energy bill savings.31 As the resilience and clean energy field matures, cities are looking to adopt other innovative strategies, such as microgrids—small networks of electricity consumers with a local energy supply source that is often connected to a central grid but can operate independently—and community-ownership models that not only supply renewable energy but also provide direct community economic benefits and enable community governance of energy systems. The findings in this report reveal that city leaders can craft climate change solutions that build just and resilient cities, and that support a fair and low-carbon economy, by embracing the nine recommendations detailed below. Some cities have included equity and justice goals and principles in their climate action and preparedness plans, including Baltimore;35 Berkeley, California;36 Boston;37 Cleveland;38 Newark, New Jersey;39 New York City;40 Los Angeles;41 Oakland, California;42 Portland, Oregon;43 and Washington, D.C.44 For example, Boston’s citywide resilience plan is framed around the goals of expanding economic opportunities for all residents, while tackling systemic racism and developing city policies using a racial equity lens. At an event to announce the plan’s release, Mayor Martin J. Walsh (D) said, “True resilience requires us to go beyond treating the symptoms of inequality, to changing the structures that produce it.”45 Boston’s plan includes new initiatives to train and provide tools to city staff to shape more equitable city policies, partner with businesses and nonprofit groups to launch a collective effort to fight racism, hold workshops for Bostonians to unpack the history of racism and inequity and to build relationships, and break down historic barriers to economic opportunities. In that same vein, when designing Baltimore’s disaster preparedness plan, city officials from the Office of Sustainability acknowledged the city’s role in redlining—the practice of denying homeownership opportunities and other services based on race and ethnicity—and other discriminatory policies.46 This acknowledgment was critical to opening up an honest dialogue with communities about how city housing practices forced people of color into more flood-prone areas of the city with limited access to economic opportunities and quality housing. While centering city climate plans around social equity and racial justice goals is critical to achieving a just economic transition, this step alone it is not enough to improve the livability of all communities. Historic injustices and discriminatory policies not only have created an imbalanced economy but have also fostered public mistrust of civic institutions.47 To work effectively with communities to design and implement inclusive resilience strategies, city leaders must take deliberate and sustained steps to build trust. This begins with developing effective and mutually beneficial partnerships with community organizations and evaluating and removing barriers to community participation in public engagement processes, as discussed in the second recommendation below. This trust-building effort also requires cities to invest time and resources in historically underresourced communities. In addition, city leaders must break down traditional silos across city planning agencies so that staff members can work collaboratively with each other and community groups to implement climate resilience and pollution reduction strategies. Lastly, city officials must develop and implement accountability measures that ensure progress toward racial and economic equity. The above steps are critical to ensuring that city climate action and resilience plans are effective, inclusive, and widely supported by city residents. By taking these steps, city leaders can accelerate the transition to a just and low-carbon economy, as well as build solid partnerships with community leaders to strengthen neighborhood capacity to help design and implement climate resilience strategies that work for everyone. City leaders have traditionally used conventional stakeholder and neighborhood advisory processes to engage communities when designing city plans. As city officials recognize the need for equity-based climate resilience planning, city leaders and community groups are creating innovative ways to ensure that residents’ perspectives are integrated into the process. These include placing equity as a primary focus of stakeholder participation and developing processes that can be flexible to meet the needs of community participants. To move a stated focus on equity from words to meaningful action and outcomes, city leaders are increasingly collaborating with community organizations and coalitions, and ideally, they would help facilitate funding and resource development for these groups. In Portland, community groups collaborated with city staff to design an effective community engagement process. Acknowledging that community organizations serving overburdened residents are often stretched to capacity, city officials secured funding to support their important role in this work. The result was the establishment of an Equity Working Group comprised of community organizations that represent low-income residents and communities of color.56 Through their active engagement in the working group, members were able to build their own organizational capacity. For example, one of the member organizations was able to create a Native American Tribal Council on Climate Change, while others hired new staff to work on climate change and resilience issues. The OCAC was founded with the goal of advancing policies that address climate change, environmental pollution, health, and social justice. The current economy is deeply imbalanced: It supports the accumulation and concentration of resources and power among the wealthiest few at the expense of equal access to clean air, water, and economic opportunities and the well-being of society.64 The Trump administration’s policies aim to perpetuate this imbalance, including by slowing the ongoing transition away from a fossil fuel-driven economy toward renewable and clean energy sources. Mayors are well-positioned to help realign the economy to restore depleted ecosystems, strengthen community resilience, and support racial justice and social equity to fulfill the ideals of democracy.65 City leaders can help rebalance the economy by designing climate solutions and resilience strategies that tear down barriers to economic opportunities for those who have shouldered the disproportionate costs of environmental and racial inequality. Some cities are already designing clean energy and climate change solutions that create pathways to new economic opportunities and jobs. Clean energy and other job training programs can help residents develop needed skills to pursue quality careers, while empowering people to improve the livability of their neighborhoods. In Miami, community members and advocates have observed a rise in real estate investment in higher-ground neighborhoods—those farther from the beach and safer from sea level rise—that may escalate the risk of displacement in low-income areas and communities of color.71 Historically, many of Miami’s high-ground communities were established by low-income people of color because they were more affordable than waterfront areas.72 Community groups are studying real estate trends in high-ground neighborhoods to better understand the challenge and to identify possible solutions. Displacement has dire consequences for the health, safety, and well-being of those affected. For example, uprooting residents from their communities pulls children out of schools, interrupting their education; severs closely knit community social networks and support systems; and forces families to pay relocation costs and to move into unhealthy, unsafe, and overcrowded housing.75 To better understand and minimize displacement risks, city officials must monitor the effects of community development projects on housing prices and on changes in the makeup and movement of the community’s residents. City leaders can improve access to well-paying jobs by expanding public transit systems, as discussed in more detail in Recommendation 5. But new public transit projects can also draw higher-income earners, driving up housing costs for existing residents. To support healthy and inclusive development without displacing people from their neighborhoods, some city leaders are working with community groups to develop anti-displacement strategies before new development and resilience projects are planned and announced.76 These strategies should be designed with community leaders and groups to help existing residents continue to live in their communities, even as hard-fought neighborhood improvements cause housing prices to climb. Cities can donate vacant and abandoned land or other city property to CLTs to support the permanent availability of affordable housing. CLTs can also be used to secure property for collective ownership of solar installations, green infrastructure, food gardens, and local businesses. There are currently about 220 active CLTs in the United States, including in New York, California, Washington, and Massachusetts.79 Community ownership, supported by CLTs, together with local advocacy groups and community-led advisory boards, can empower communities to implement their own visions of community livability and resilience, while reducing the risk of pricing out existing residents in the process. City officials can also make housing more affordable for all residents, desegregate neighborhoods, and help people stay in their own communities as they improve by eliminating exclusionary zoning and land-use policies.83 Many cities are already doing this through inclusionary zoning that requires new development projects to include a specific portion of affordable housing units. In November 2016, Los Angeles voters passed Measure JJJ with 64 percent of the vote to expand construction of more affordable housing by the local workforce that would be situated near public transit stops. In March, the city released Measure JJJ implementation guidelines, which set different requirements for affordable housing depending on how close the development is to public transit.84 According to the guidelines, new housing construction within 750 feet of a public transit stop has the option of building 11 percent of the units for tenants earning less than 30 percent of the median income, 15 percent for those earning less than 50 percent of the median income, or 25 percent for those earning less than 80 percent of the median income.85 In exchange, the city offers developers options to make up for lower income earnings from the affordably priced units, which include loosened parking, setback, density, and building height requirements.86 By supporting inclusionary zoning policies, city leaders can maintain affordable housing options and help people stay in their own communities, even as new development and neighborhood improvements drive up rents. In November 2016, more than 70 percent of Oakland voters passed Measure JJ to protect renters from unreasonable rent hikes and evictions.88 The measure—backed by a broad coalition of housing, labor, community, and faith groups—aims to address the ongoing housing supply and affordability crisis, where housing prices are the fourth-highest in the nation and 60 percent of the city’s residents are renters.89 Measure JJ requires landlords to file a petition to raise rents beyond the annual consumer price index increase and strengthens a previous “just cause for eviction” measure to protect tenants from eviction.90 By maintaining fair rents and stopping illegal evictions, city officials can help prevent longtime residents from being pushed or priced out of their communities as new development and resilience improvement draw new residents and drive up housing costs. At the same time, the program will provide up to 300 low-income single-family homes with solar power. The city launched its Atlanta Beltline plans to link its existing rail and bus system with 22 miles of streetcar lines and 33 miles of multiuse trails. Many city leaders are improving mobility for city residents by increasing bus rapid-transit services. For example, Los Angeles recently passed a nearly $1 billion-per-year transit and traffic improvement investment package over 40 years that includes bus rapid transit as a major component.126 The plan will add 465,690 new jobs across the region and stimulate $79.3 billion in economic output in Southern California. The new bus system aims to take advantage of the city’s extensive highway system to improve city connectivity and reduce congestion and pollution. Not all transit solutions involve buses, bikes, or trains. Advancements in mobile connectivity have enabled the rise of carpooling, ride-share programs, and transportation network companies (TNCs) such as Lyft and Uber. 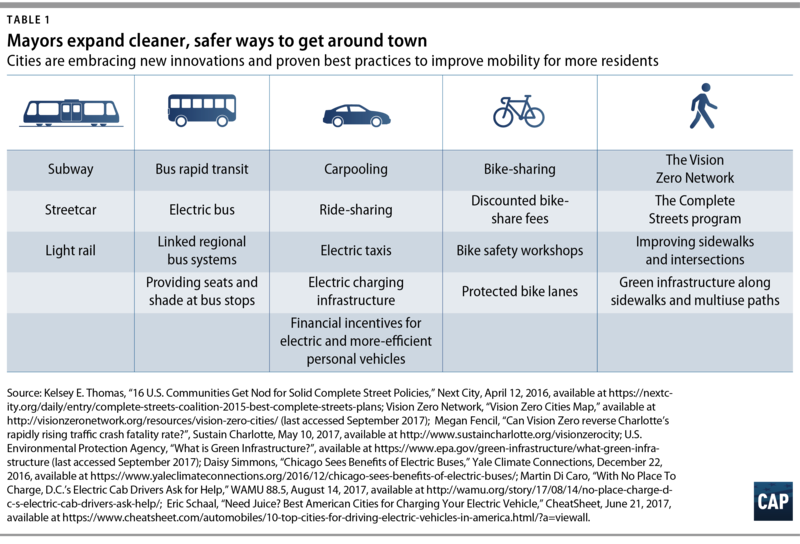 While government at the municipal, state, and federal levels is still developing regulations for these nascent transportation options, these alternatives have the potential to shore up mobility gaps for those without the ability to drive or access a personal vehicle or adequate public transit.129 While TNCs could help encourage more drivers to rely less on personal vehicle use for mobility, they may also have a negative effect on the taxi industry in urban areas, which offers higher wages than TNCs and is well-regulated for public safety.130 According to the National Academies of Sciences, Engineering, and Medicine, “if TNCs weaken or bankrupt many taxi services, then those without credit cards and smartphone access may find themselves with fewer mobility options than before.”131 Policy leaders at the local, state, and federal levels must carefully evaluate the potential impact of TNCs on employment conditions and wages, accessibility and equity, and public safety as they design TNC regulations. Community-based organizations are also working to encourage biking and bike-share participation in low-income areas. In Chicago, the Urban Juncture Foundation is helping improve the mobility of Bronzeville neighborhood residents—a historic and culturally rich community that was devastated by discriminatory housing practices and an expressway that cuts off residents from economic opportunity—by leading bike safety workshops to encourage biking and bike-share program use.139 Lastly, city officials across the country should expand safe bike lane networks beyond central business districts to low-income areas and communities of color. In the wake of Superstorm Sandy, roughly 30 percent of the small businesses along the Eastern Seaboard that were negatively affected by the storm permanently closed.175 Many struggling households face added financial insecurity in the wake of storms as they cope with lost wages, damaged property, or both. And many never fully recover from a disaster. In the worst economic cases, families are pushed deeper into poverty or become homeless in a disaster’s aftermath.176 Even when extreme weather events and other climate change effects do not trigger disaster declarations by government officials, they can create costly, dangerous, and even deadly emergencies in communities struggling to make ends meet. Smarter and more compact community development with higher-density housing can minimize sprawl into floodplains, as well as the paving over of natural spaces that drink up stormwater. When city leaders launch sustainability and resilience planning initiatives, they must answer two key questions: sustainability and resilience for whom, and sustainability for what purpose?192 The quality of a city’s environment and physical infrastructure is fundamental to a vibrant local economy and community health. Today’s city leaders are simultaneously dealing with unequal urban environments that stem from past actions and designing and implementing strategies that will meet the city’s future needs in a climate-uncertain world. In doing so, many cities are providing leadership on the issue of social cohesion, recognizing that deeply connected communities are a critically important element in overcoming historical inequalities and contributing to a city’s climate resilience. The Organisation for Economic Co-operation and Development defines a socially cohesive society as one that “works toward the well-being of all its members, fights exclusion and marginalization, creates a sense of belonging, promotes trust, and offers its members the opportunity of upward social mobility.”193 The role of U.S. cities as places of cultural, economic, and social diversity makes them perfect settings for drawing on the creativity of small- and medium-sized businesses, as well as socially responsible corporations and community members, to strengthen social cohesion. 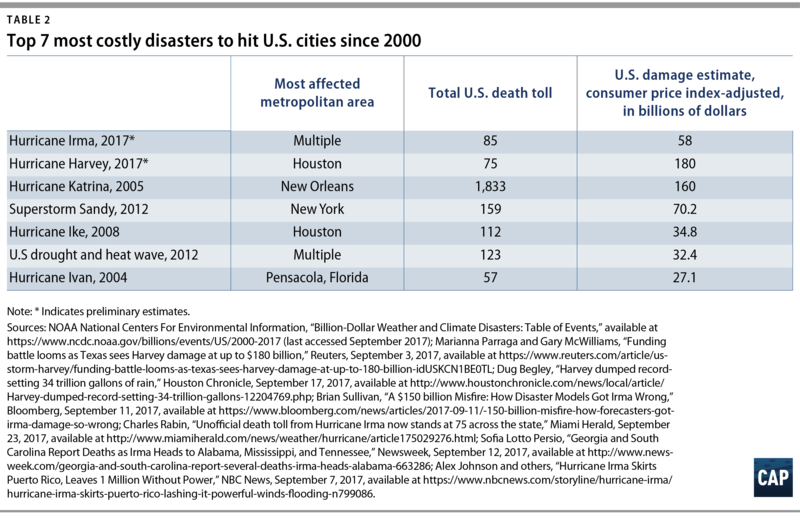 These and other innovative financing strategies are helping U.S. cities save lives and lower rebuilding costs as the risks of extreme weather, sea level rise, and wildfires rise in a warmer world. A clear majority of Americans recognize the threats of man-made climate change to the United States and its cities.222 A number of cities are already applying principles of equity and smart risk management to support equitable economic growth that will save money and lives in the face of more extreme weather and climate change. By embracing the nine actions recommended in this report, mayors can support pathways to a just economy and expand access to living-wage jobs, quality schools, affordable housing, and safe neighborhoods, while at the same time reducing extreme weather and flood risks that are increasingly part of the new normal in a hotter world. Cathleen Kelly is a senior fellow for Energy and Environment at the Center for American Progress. She specializes in international and U.S. climate change, preparedness, resilience, sustainable development, and Arctic policy. Kelly served in the Obama administration at the White House Council on Environmental Quality, where she led a 20-plus-agency task force to develop a national climate resilience strategy. Previously, Kelly directed the Climate & Energy Program at The German Marshall Fund of the United States, held policy director and senior policy adviser positions at The Nature Conservancy and the Center for Clean Air Policy, and was a professor at the Johns Hopkins University Paul H. Nitze School of Advanced International Studies (SAIS). Cecilia Martinez is the co-founder and executive director of the Center for Earth, Energy and Democracy. Martinez previously held positions as associate research professor in the College of Earth, Ocean and Environment at the University of Delaware; associate professor at Metropolitan State University; and research director at the American Indian Policy Center. She has led a variety of projects to address sustainable development at the local and international levels. Her research is focused on the development of energy and environmental strategies that promote equitable and sustainable policies. Walker Hathaway-Williams was an intern at the Center for American Progress and is a student at the University of California, Berkeley. The authors would like to thank Miranda Peterson, Carl Chancellor, Rejane Frederick, Luke Bassett, Sarah Edelman, Michela Zonta, Patrick Dolan, Danielle Baussan, Kevin DeGood, Christy Goldfuss, Meghan Miller, Shanee Simhoni, Howard Marano, and Erin Whalen for their contributions to this report.